Only when they experience the first signs of a leak in the roof do homeowners scramble to get their roofing inspected. Things may start with a small, practically unnoticeable drip of water from the ceiling, a wet spot that darkens and slowly grows larger as it spreads, or a puddle on the floor. Leaks can spring up after a severe storm or after a winter that included a severe buildup of ice on your roof. The rule of thumb for when your home has recently been exposed to extreme weather is to keep on the lookout for damage, such as missing shingles or holes in the roof. If your roof is already beyond its service life, you should be even more vigilant against any damage that may compromise the safety of your home and your loved ones. Leaks can be isolated, in which case you may simply need a quick repair. Have an inspection done by a reliable roofer to determine the extent of the damage. If you’re experiencing leaks in several spots, a replacement might be the smarter thing to do. Nothing lasts forever – and that’s as true with a roof as much as it is for anything else. Old shingles are pretty easy to identify – cracked, curled or missing shingles are, for instance, pretty reliable indicators that you might be due for a new roof. Shingles are coated in mineral granules that give it its texture and protect it from sunlight — shedding often signals the end of their useful life. It’s important that you determine how old your roof is; if you’ve got asphalt shingles, you’re looking at a lifespan of between 15 to 30 years. So, if your roof is a roof older than 20 years, it would probably be better replaced. Do you plan on staying in the home for a while? If so, then it might make sense to invest in a roof replacement. Look to incorporate environmentally friendly features for which you can claim tax credits. Also, aim to upgrade to sturdier, longer-lasting materials that’ll also help improve your home’s energy efficiency and performance. 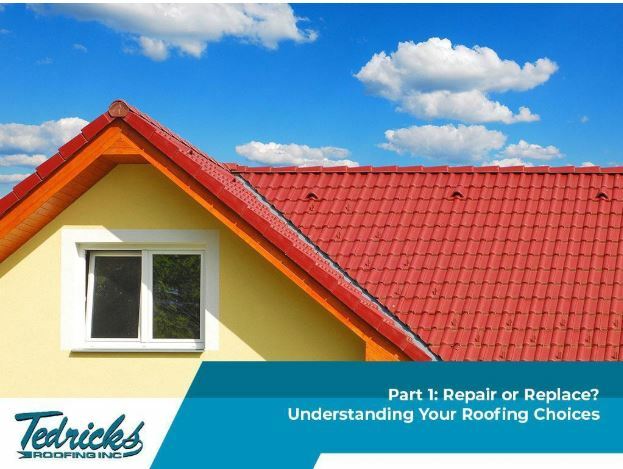 These are just a few of the things you need to consider when deciding whether to have your roof replaced or repaired. Roofing replacement does involve a significant investment, so you’ll most definitely want to ensure that you get the most out of your existing roof before replacing it. When the time does come that replacement becomes inevitable, make sure to find yourself a contractor who values your needs rather than someone who’s focused on their bottom line. Pick quality roofing material to qualify for significant discounts on your homeowner’s insurance policy. Materials that are more resistant to fire, wind and hail damage will often result in lower rates. In the second part of this blog series, we’ll compare the various roofing materials available to you so you can better decide which material is bound to keep you happy for the longest time.